These handcrafted natural stone and copper earrings by Pebbles at My Feet artisan Pamela Hollis feature small tablets of rhyolite. The rhyolite stones have a layered appearance in earthy pink and brown colors. I see sandy creamy pink, merlot, dusty rose, taupe brown, and marsala tones in the stones. I set them with copper wire that I gave a rich dark brown patina. A red coral disk is a bright colorful accent. Mixed shapes: the rhyolite tablets, the coral disk, and a deeply ridged copper bead play point-counterpoint giving the design a touch of the East. 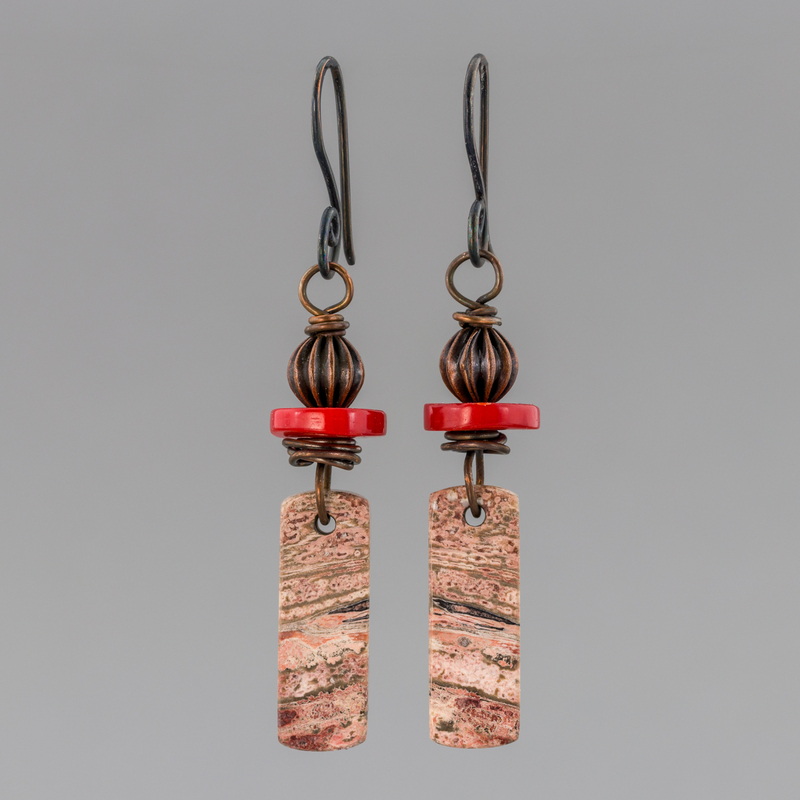 My rhyolite and coral copper earrings are a linked dangle style. They fall just a tad over 2-inches long (52mm) from the top of their handcrafted ear hooks. This is a great length for the woman who "doesn't usually like dangles" since they are lightweight and not too long. The beautiful rhyolite tablets were cut by Marc of Hampton's Rock Shop in Oregon. If you like stunning stones why not follow his page on Facebook? Here's the link: https://www.facebook.com/hamptonsrockshop?fref=ts I'll be listing more jewelry with his great lapidary work.